Keep your body in motion with joint implants! Joint implant surgery is a leading form of treatment for arthritis, a common condition marked by inflammation of the joints that is often caused by overuse. At the Foot, Ankle & Leg Vein Center, Dr. Schoenhaus and Dr. Gold offer joint implant surgery for the toes and ankles. Joint implant surgery is an elective procedure often used to reduce or eliminate the pain of osteoarthritis. It is also commonly used to correct damage caused by trauma or injury. 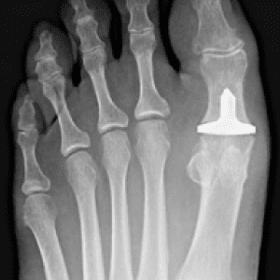 This type of corrective surgery is done in the toe or ankle and can assist in reducing pain and improving mobility in those with severe arthritis pain. Foot arthritis often affects older people, especially those who have spent excessive time on their feet, such as for work. If left untreated, foot arthritis can impede mobility. The condition causes swelling, deformity, severe pain and potentially permanent joint damage. Foot arthritis can make it especially difficult to walk, and the associated pain often grows worse over time. Foot arthritis is commonly treated through a combination of lifestyle changes such as weight loss, wearing bandages and anti-inflammatory medication use. Joint implant surgery is among the most successful treatment options for ankle and foot osteoarthritis. Dr. Schoenhaus and Dr. Gold use the leading technological advances during joint implant surgery and offers the newest and best suited materials available. During this procedure, Dr. Schoenhaus and Dr. Gold remove damaged bone and cartilage from the problem area and replaces it with a customized synthetic joint. The replacement joint is generally made of plastic or metal. The most common joint plant surgery conducted on the feet is at the metatarsophalangeal (MTP) joint, located at the bottom of the big toe. During most joint implant procedures the patient is placed under general anesthesia. For certain procedures a local anesthetic may also be applied directly to the targeted area. During the procedure, the damaged portion of the joint is removed while as much of the remaining healthy cartilage and bone is preserved. Depending on the extent of the damage, the synthetic joint may replace all or part of the inflamed joint. Following the procedure the foot will remain in a cast for several weeks while the joint heals. Once the joint has healed, the implant will permit greater range of motion and full mobility. Many patients are even able to wear slight heels as desired.